Week 11 of the 2014 NFL season kicks off with the Buffalo Bills battling the Miami Dolphins on “Thursday Night Football”. There’s only six weeks left in the regular season and season-long office pools around the country are heating up. Get a printable NFL Pick Em Week 11 sheet absolutely free right here. Longtime AFC East rivals get Week 11 of the 2014 NFL season underway. The Bills continued the longest active playoff drought in the league by finishing 6-10 in 2013. However, Buffalo swept last year’s season series with Miami. After notching a 23-21 in Miami in Week 7, the Bills blanked the Dolphins, 19-0, in Week 16. There are nine early Sunday games on the NFL pick em Week 11 sheet. The San Francisco 49ers will travel across the country to clash with the New York Giants in the Meadowlands. Reigning division champions will collide in another NFC bout, as the Green Bay Packers will host the Philadelphia Eagles. Early division battles are also on tap, as the Bears will host the Vikings and the Falcons will face the Panthers. Only two late Sunday games are on the NFL pick em Week 11 sheet. The San Diego Chargers will host the Oakland Raiders, while the Arizona Cardinals will clash with the Detroit Lions. Sunday’s action wraps up with Andrew Luck and the Indianapolis Colts colliding with Tom Brady and the New England Patriots in a playoff rematch on “Sunday Night Football”. 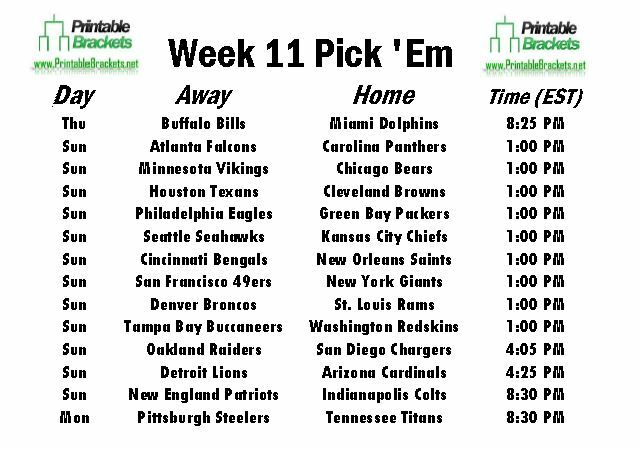 The final game on the NFL pick Week 11 sheet features Ben Roethlisberger and the Pittsburgh Steelers taking on the Tennessee Titans on “Monday Night Football”. A total of four teams will have their bye week in Week 11. The Dallas Cowboys, New York Jets, Jacksonville Jaguars and Baltimore Ravens all have the week off.